Writing: discussion essay on language teaching. This essay is about teaching a foreign language with new technologies, like: E-learning Platform, Content and Language Integrated Learning and Information Communication Technology. The benefits of introducing a foreign language are numerous. For example: the children start to enter in a new world of knowledge through new technologies. At the same time they are learning a foreign language. Research prove that students who learn new topics with visual learning get better skills. Therefore, when they reach the Primary level students will be familiar with the foreign language that they have been taught in prenous years. That’s why the teacher should teach in a funny way: short and funny songs, with known stories in the foreign language or with English Educational games. And all of this could be taught during any activity. For example: If the week’s topic is “wild animals” we can find English songs or an English story about “wild animals”. Children can also go to the computer room to use a computer to find activities on their week’s topic in different languages. Finally my briefly opinion is that using new technologies to learn a foreign language is appropiate although you need to care more about the child’s development: their needs, motivations, rhythm... Because, as we know, every child is different. And therefore all students learn at a different pace. Don’t you think so? St. George’s day is on 23 April. It is the patron saint of England and it's national day. The popularity of Saint George in England comes from the time of the crusades. He was a roman soldier that protested against the romans tortures of Christians and it is said that he died for his beliefs. Saint George is always represented as a knight carrying a shield with a red cross, usually riding a horse and always killing a dragon. And for this reason the best-known story about Saint George is the one where he fights with a dragon. I think that to introduce English in Infant Education we must do this in an entertaining and attractive way for the children. For this reason, I thought introducing a known vocabulary in Spanish to learn in English. This topic is toys, for Infant Education, and the materials of these toys in Primary Education. It is the same topic for both levels, but the first is easier than the second. Become familiar with the names of toys. Become familiar with the material of toys vocabulary. Learn the names of toy: car, doll, robot, teddy, train, bike, plane, computer games, puppet. Learn grammar structures: Where’s the ....? It’s here/ It isn’t here. Identify what the toys are made (plastic, wood, metal, fabric). For example: the doll is made of fabric. Find the odd object isn't of our topic. Put away the things that they aren't using. Organization: the lesson will be divided in three parts: the first is the assembly, where the teacher explanes and presents the topic (10-15 minutes); the second is the activity, where the kids learn the vocabulary and the grammar (15-20 minutes); and the last is the story, where the teacher, with the help of the children, read a little story about the topic (10-15 minutes). The duration of the parts will always depend on the rhythm of the class and on the kids interest. Therefore, if the activities are prepared for this lesson and they can’t be taught, kids can be taught another day in another lesson. Place and space: this lesson will be in class. And if it is possible, in a large space where children and teacher can sit in a circle and see each other. Time: the duration of this lesson is approximately of forty-five minutes, but everything depends on the participation and attention of the pupils . 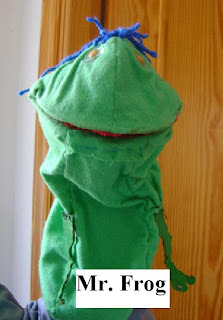 Materials: to do this lesson the teacher will need: a puppet (because in the English lessons the teacher puts his hand inside Mr. Frog), real toys (car, doll, robot, teddy, train, bike, plane, computer games, puppet), flashcards of these toys, a bag to take out the toys and a story (The lost teddy or Where’s my teddy?). Teacher’s role: in the English lessons the teacher must try to find a way to make lessons funny and exciting for the children. Also to help to learn English in an autonomous and reflective way. In this lesson, first the teacher sits the children in a circle and explains that with the help of Mr. Frog we learn English, then we will use the toys and the vocabulary in English to play a game and at the end we will read a story. After that, Mr. Frog presents the topic: The toys. For this Mr. Frog talks to the pupils about toys: ask them if they know any words in English of toys, what words they would like to learn, etc. Next, Mr. Frog tells the pupils to bring toys into the middle of the circle. And Mr. Frog takes, one by one, the toys and says its name. For example: ‘It’s a car’ says Mr. Frog, and then the children repeat. When the children repeat the name Mr. Frog calls a kid and he put the toy in a bag. Like this, with all the toys. Secondly, the teacher distributes a toy flashcard to each pupil. Now Mr. Frog explains that he will ask where’s a toy. For example: ‘Where’s the teddy?’ and the teacher takes out the teddy of the bag. Then the boy that has got the teddy says ‘It’s here’ and holds up the flashcard. Like this, with all the toys. When all the toys are out, the teacher asks the children to put the toys back in their place. And finally, Mr. Frog tells a tale: The lost teddy. But before the teacher gives each student his own story and he takes out the big story book. To do this essay we should choose one topic: write about which age is the best to finish compulsory education or what I think about the Government's plan to introduce laptops in classrooms. Between this two options I choose to write about which age is the best to finish compulsory education. Nowadays, in Spain, students have the possibility of finishing their studies at the age of sixteen, that is to say finallize their formaly education after completing the obligatory stage or before reaching this age. For this I believe that compulsory education should be until the age of eighteen. Because in this way they would have the chance of making their studies longer and the probability of finding a better qualified job increases. With this new change the obligatory stage will be longer and the students will end up with better knowledge. In other words, finishing at a later age means that students are more matture therefore can make better decissions about their future. But all of the pupils don’t have the same interests, so it isn’t fair that all of them have to course Bachillerato. For this reason there should be able to choose between two options, for example: course Bachillerato or a training course (Modulo de Grado Superior). In my opinion this is a successful change, because they are our future in this society, so they need to have as many facilities as possible for nowadays life. A good education is the one, that lets the student choose his own way within limits. Don’t you think? Sembla que ve Nadal, no?